Safety is the first priority at Montgomery County High School. The first line of defense is to make sure students are in the right place, at the right time, doing the right things. With this being said, following the guidelines established by our student handbook is very important. You received an excerpt of the handbook addressing the most common infractions on the first day of school. A copy of the complete handbook is online and you may request a printed copy of this by calling or coming by the school. As noted in the handbook, changes are made by administration as needed. It has been brought to our attention that students connected with gang activity have been bringing bandannas to school. As a result, bandannas of any kind will not be allowed at school until this issue is resolved. We appreciate your support as we take an active stance against inappropriate activities trying to make their way into our school. 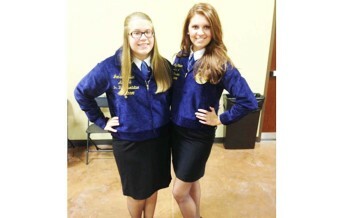 Montgomery County FFA members Kaylee Coleman and Jansen Killian.